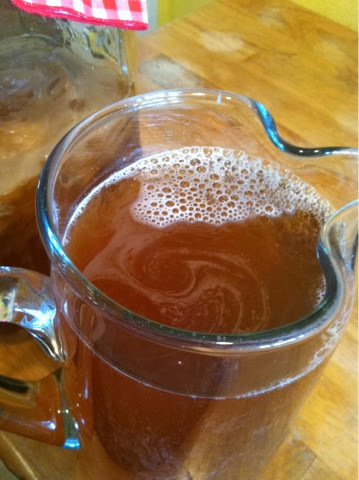 Continuous Brew Kombucha is one of the best decisions I have made in my Homestead Kitchen. 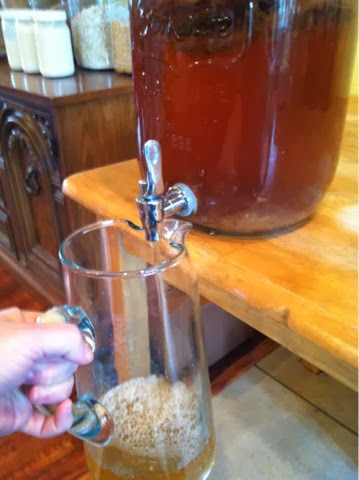 It is so much easier and it makes up faster, which means, my hubby... who LOVES kombucha has more booch when he is ready for a nice cold bottle. "WHY have I not tried this sooner?" 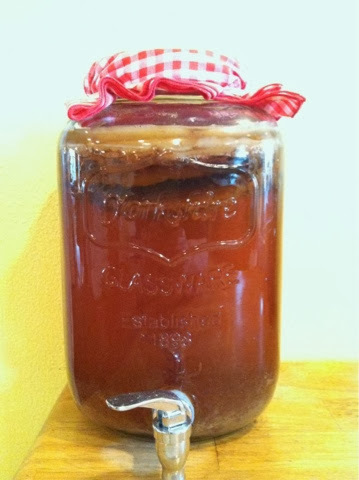 First, obtain you a scoby and some kombucha liquid. Next you will need a decanter, such as the one I have pictured below. If you don't have one, here's a nice one on Amazon. Brew 1 gallon of black tea. Each gallon will need 1 cup of sugar. Bring the tea to room temp. Pour tea into dispenser. Add scoby and your liquid. Let set for about 1 week. This is a big deal. I let my tea go for 10 days -2 weeks as normal and it was FAR too vinegary for us. Kombucha has a bit of a vinegary taste, but this was almost just like drinking vinegar. Brewing like this is a learning process. You will find out what length of time works for you. Just so you know, this way of brewing brews much faster than a regular batch of kombucha. Get yourself in a habit. Mark it on the calendar if you need to. 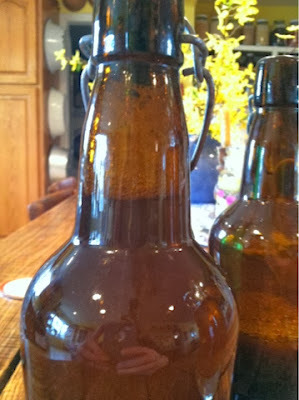 Each day on that day, is kombucha day. Plan on brewing your tea, pulling off your kombucha and then replenishing your supply. 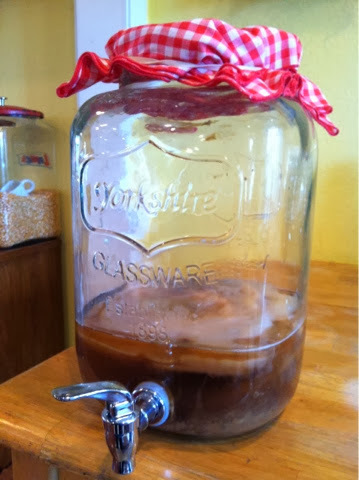 To pull off your kombucha for the week, simply put an empty pitcher under your spout and empty your decanter until you have only about 20-30% of your kombucha left. You should see a nice, golden brown, bubbly liquid being dispensed into your pitcher. 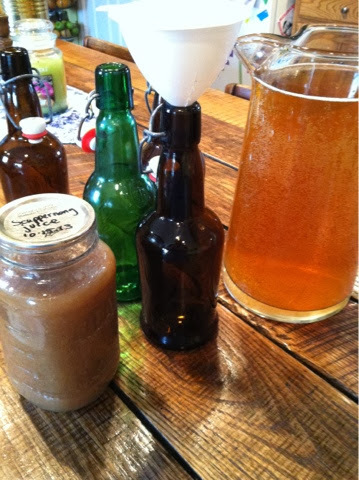 This is how we flavor our kombucha. We take the same ratio. About 20-30% juice to kombucha. If you look in the below pic, I tried to show you about how much juice I have in the bottle. Fill the rest with kombucha. Leave a bit of room in the neck for that pressure to build. 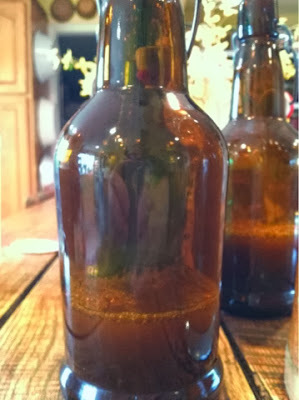 The bubbles show that there is some carbonation happening. That is good if you want a fizzy drink. Which is one of the perks of bottling the kombucha like this. With your bottles, you may want to leave them out on the counter a day or two to let the pressure build, so that you will have a more carbonated finished product. It also gives time for the kombucha to 'marry' with the juice. That gives a tastier product too! Now that you have pulled off this weeks kombucha, you should have a mostly empty jar. Take that room temperature tea you have made and fill it back up. Let it go until next week and do it all over again!